The Clay-coloured Sparrow behaves a bit differently compared to other North American birds when it comes to breeding. 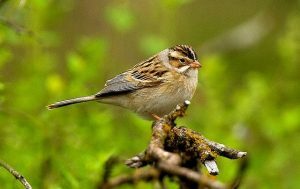 For starters, this species uses different breeding and foraging habitats that allows the male to defend a breeding territory that is quite a bit smaller than the territories of other sparrows. This episode aired on Saturday July 23rd, 2016.